I purchased these because I was told they worked with Pentax. That is not the case and since I do not have an off camera flash for my Nikon, I don't need these. 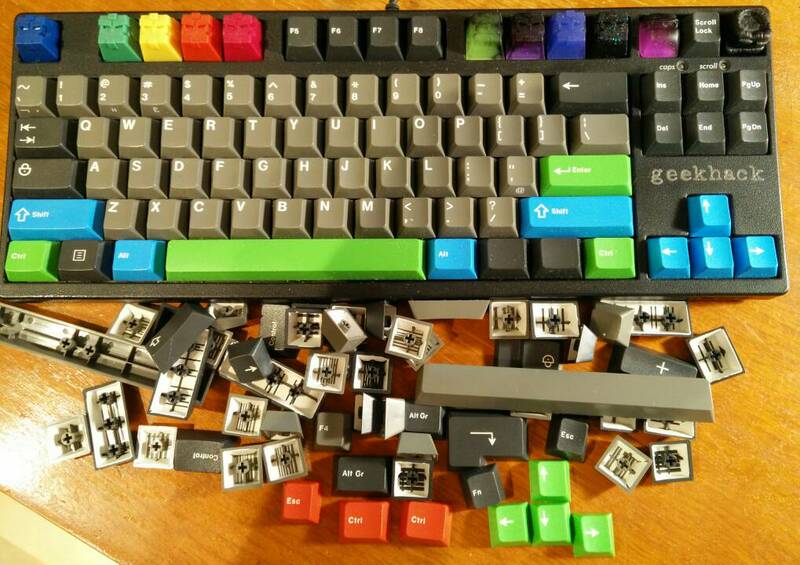 I am splitting up the keycaps and selling them individually at this point because I have interest in all/most of the sets. I would prefer to sell all the sets together, so I will give people till Wednesday, Dec 4th to purchase all sets together. After Wednesday I will start selling the sets individually. I believe I have interest in all the sets now; confirming... If I do, I will split them up right away. Good luck, I searched around for one for a while and eventually caved and bought one from EK. Now that you have at least 60 posts, you can post a WTB thread in Classifieds and see if anyone responds. Although there are one or two such threads there already. Keep an eye on Classifieds in case one appears. Check online auction sites regularly (where I got mine from, $180). Im in Montreal, Canada. Not sure of the shipping costs from the UK. PM me if you think we can work something out. I know you are looking for trades as well. Unfortunately the only thing I would be able to trade would be a 3 week old White Filco Ninja 104 w/ Red switches. you can try buying directly from amazon japan using tenso.com as your proxy. i got mine that way and its $50 cheaper than getting from EK. i live in asia btw, you can calculate first the costs according to your location though. How can it be $50 cheaper? How much of a hike does EK do? I got 4 Sets of Tai Hao (Green, Red, Blue and Yellow). I think elton didn't ship it yet. If you're online, leave me a note. Thanks! I did that before and it was cheaper for me as well. I think amazon.jp increased the prices by ~$20 since then though. I have an extra HID Lib controller. Added full sets (including 6.25 spacebar) of Tai Hao keycaps. If you are interested in only one set, PM me and I will give you priority for that set if no one buys all of the sets by Wednesday (Dec 4th). GLWS! Pardon my ignorance, but does the Tai Hao set come with stepped caps lock? That is actually a really good question and I don't know the answer. I will have to check when I get home tonight. I will get back to you on that. I'd be interested in the yellow key set if you can't find anyone to buy the whole bundle. likewise I'll probably want the green set, if you end up selling them separately that way. Might be Thur/Fri before I can buy them though. You mention a filco plate ... do you have much experience working with them? I'm hoping to stuff a phantom into an official Filco case using the (plate mounted) switches lying around. Do you know if I'll need a special 'thing to look for on a potential plate so it will interface both the phantom board and the filco case properly? I should just split them up... I have buyers for all caps if I sell them individually. Tomorrow evening I will verify that I have buyers for them all, if I do, I will just split them up and not wait till wednesday. I don't have much experience with changing the plates. I believe one of the phantom plates fits a Filco case, but not the one with ears from what I understand (like what The Beast is selling). There are a couple people interested in the red set so far. I will let you know if it becomes available. Right now I have PMs out to a lot of people to verify their interest. If any kits become available I will let you know. I have a phantom ansi125 plate. Will that suffice? Does it have the controller cutout above the arrow keys? Awww... No it does not. Sorry! Forgot about that. Interested in the black set if you still have them. Update: All Tai Hao sets have been sold. jcrouse has GH60 pbs and plates for sale. Techkeys has stickers available here. All your base are belong to us! exactly my thoughts. free bump. $7 before shipping for 120 switch stickers is retardedly expensive. I ended up getting ~500 for $16 and forgot to update the thread. Page created in 0.126 seconds with 74 queries.